My trip to Australia was a big one for me. I decided to spend spring break of my junior year of college on a solo trip. I can't say I've heard many people taking trips on their own across the world, but I'm so happy I did. I flew from New York to Los Angeles to Melbourne and spent a few days with a good friend who I met on a trip in Scotland. From Melbourne I flew to Cairns where I swam in the Great Barrier Reef! Then I flew down to Sydney (yes, I couldn't stop smiling that I finally made it to the city I was named after), then drove to New Castle with another friend I met in Scotland, and finally ended the two week trip back in Sydney. I was all over that beautiful continent in a matter of fourteen days and I can't wait to share why I love it so much. A lot of adults say there was a time during their 20s where life just clicked and they "found themselves." Australia was definitely that place. HOUSING When I first met Elise three months earlier in the Scottish Highlands I immediately knew she had a heart of gold. "Come visit me in Aus," she said. I don't think she really expected me to fly across the world, but I did! I stepped off a 24-hour flight, into Elise's car, and we didn't stop one bit for three days. It meant the world to stay with her loving family for a handful of nights. There's something so special about staying with a local in a new city. If you know someone in a city you're visiting, ask them if you can bunk with them for a few days. I'm sure they'll give you an enriching perspective...one that is far different from a guide book. FOOD Elise is a practicing physiotherapist but I wonder everyday why she didn't pursue culinary school. She is the Australian Food God. Elise knows every trendy café, coffee bar, and asian-fusion restaurant. I ate some of the best food of my life with Elise during that long weekend with her. If you're in Melbourne, visit Higher Ground for the most beautiful ricotta hotcakes (almost too pretty to eat! ), Industry Beans for their avo toast, and Lucy Liu for a trendy asian-fusion dinner. Melbourne is to Australia as Brooklyn is to New York. If there's a city in Australia I'd live in, it'd be Melbourne in a heartbeat (sorry, Sydney). SIGHTS Elise made it so easy for me to see the best of Melbourne in just a few days. Her friends from school were visiting from Tasmania (so cool!) the first day I arrived. We had drinks along the river and went on a graffiti walking tour. Melbourne has the most incredible street art. Not the kind of graffiti that doesn't have an artistic purpose...I mean really beautiful work. 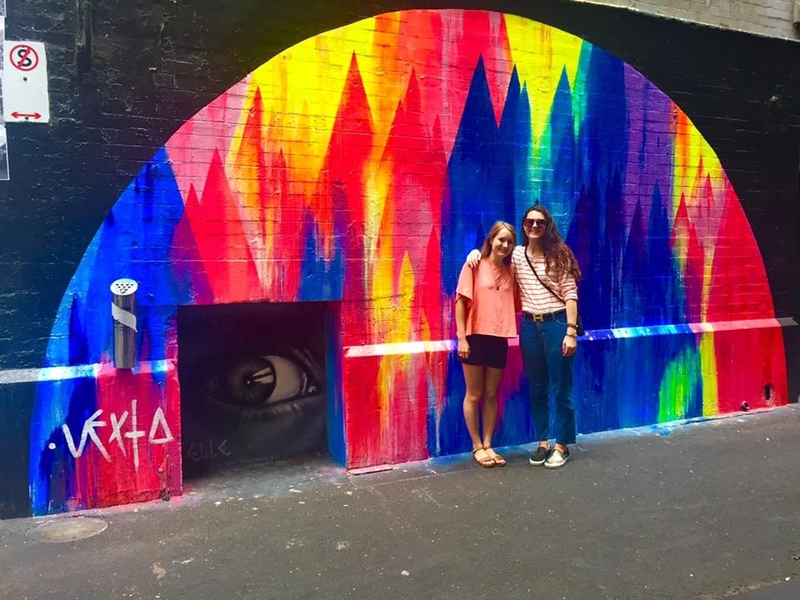 Hosier Lane is a narrow alley way where artists flock to share their work. Sometimes their murals are only up for a few days before another person comes in to cover it with their own masterpiece. Melbourne has an artistic heartbeat that I quickly learned would inspire my own work. Don't miss the Melbourne Museum (no admission charge) where you can view work from all around the continent from centuries past. Lastly, an important note is that Aussies.are.coffee.snobs. They'll be proud to admit this. Try several cafés if you can, because I promise you it'll be some of the best in the world. What made me happiest was knowing visitors and locals appreciated the incredible work of these artists. I watched a man, no older than 20, working tirelessly on a mural. He focussed so carefully on each stroke knowing the reality that his work could be covered up the second he stepped away for the day. I respect those who work to all ends for their creative work. To put these murals in perspective, I'm 5'11"! Saying goodbye to Elise reminded me of something so important...I was hugging my friend who I'd only met a short three months before at which time I only spent four days with. My time in Melbourne was only four days too. So, collectively I'd only spent eight days with this woman who I so deeply appreciated and cared for. Elise is a true friend, one that opened up to me and supported me so quickly. You never know exactly why you meet someone, but all I know is I'm so thankful for her friendship so many thousands of miles away from my home in New York. Hugging her goodbye was so difficult because as I walked away from her car and into the airport, I asked myself, "When is the next time I"ll see Elise?Maybe in a year, maybe in five, or maybe never." All I can say is I will cherish that weekend in Melbourne with her. I will forever look back on those days of laughter, delicious food, and shared secrets as one that showed me what true friendship entails. "Bye Bye Melbourne," but not for too long. HOUSING Something I was reminded during my travels in Australia was that it is NOT a small country. To fly from Melbourne to Cairns is like flying from the bottom to the top of the US. As I stepped off the plane in Cairns I was hit with a wall of heat! It's so much warmer in New South Wales and I was very much in need for some Vitamin D! I found a reasonably priced, safe, and well-furnished AirBNB that was a short walking distance from the main boardwalk along the water. I was venturing off in Cairns all on my own, so I wanted to make sure I was in a safe neighborhood. I'm always on high alert while I'm traveling, but even more so when I'm in a city without anyone I know. My AirBNB was actually part of a small hotel. Though it didn't have the "homey" feel, checked all my other boxes. Check out my room here. FOOD Cairns was known for its seafood, so I had my fair share of fish tacos! My favorite evening was spent sitting along the boardwalk across from the marina, watching the sunset. I had to pinch myself because the colors in the sky were so spectacular. Food is inevitably expensive in Australia, but you might as well pair the food with a picturesque view if you can. I really enjoyed my meal at Dundee's. Another tip if you're staying in an AirBNB with a kitchen is to make some meals at home. I particularly like to make breakfast in my AirBNB because it's much cheaper to buy a box of cereal for your stay and eat it in your room before heading out for a day of exploring. I always save my food money for a nice dinner out. I was always impressed by the variety of landscape in Cairns: miles of clear blue ocean with vast mountains and thick jungles. SIGHTS The main reason for visiting Cairns was to swim the Great Barrier Reef. I couldn't fly all that way to Australia without seeing it. Unfortunately due to coral bleaching, the GBR has lost most of its color and the reef is slowly but surely dying. I signed up for a day trip of snorkeling and it was the one of the best excursions I've ever done. I spent hours on Trip Advisor scanning different sights for snorkeling trip of the GBR. I wanted a reasonable price, safe boat, and a small group...I got that and so much more with Reef Daytripper. For roughly $100 I had a full-day experience with ten or so other travelers from all around the world (Germany, France, the US, etc.) and got to see one of the greatest natural wonders of the world. I couldn't have asked for a better more incredible experience. I swam with a sea turtle, saw a clam the size of a car, touched a jelly fish and electric blue sea star, and swam amongst the brightest coral reef. I've never felt smaller in my life and was reminded of how incredibly beautiful our great, big oceans are. What I loved most about Australia (besides the accents) was that the landscape was so incredibly diverse. They have big cities, lush rainforests, and a crystal clear ocean. A friend recommended I sign up for a rainforest tour while in Cairns and I certainly wasn't expecting the rainforest to be so dense. I found another day tour under $100 and my guide conveniently picked me up at my AirBNB in a fancy schmany Land Rover (so outback-esque). I lucked out and shared the tour with the most fascinating lawyer-turned radio host from London. As we drove deeper into the rainforest and up steep mountain sides, I couldn't help but feel like I was in Jurassic Park. Our guide informed us that Queensland has some of the oldest rainforests in the world because they existed before Africa and Asia disconnected into their own land masses. Did you know Australia doesn't have any monkeys on the entire continent? They just never made it there before the land separated. So cool! I really enjoyed venturing off into a totally different landscape for the day with another female solo traveler. The woman, Louise, encouraged me to never stop traveling, even if it means going on my own. She said some of her fondest memories in her twenties have been solo trips because she met interesting people and was able to become more independent along the way. Solo traveling gives you the opportunity to meet others and I'll carry Louise's words with me for the rest of my life. If you're looking to book an excursion, I highly recommend reading others' Trip Advisor reviews. Know what you want: big or small group, full day or half day, etc. Doing your research is worth it because you don't make the same mistakes others have! If you visit New Castle you must indulge in a Hunter Valley Wine Tour. Whether you go through a tour company or just drive around on your own, I can't stress enough how beautiful the scenery was. There are dozens of vineyards to choose from, but in my opinion, you can't really go wrong. Be sure to bring home a bottle of your favorite wine! They sell travel bags to keep it safe on the plane ride home. My favorite vineyard was Audrey Wilkinson, founded in 1866! Perfect views, friendly staff! I lucked out and had the opportunity to stay with another friend I met in Scotland during the same trip as Elise. I never would have visited New Castle unless I saw my friend Ben, but I'm so glad I did. I was able to meet his roommates, see his university, and learn more about the small city. Just another reminder of how important it is to tap into your resources and stay with friends because you'll gain so much more! HOUSING This was by far my favorite AirBNB in Australia. I did a lot of research and found a woman who only accept female solo travelers. She was absolutely lovely and had the most beautiful apartment near the Central Business District (CBD), which is definitely the neighborhood to stay in if you're visiting. My host had a huge bulletin board with a map printed on it. Hundreds of previous guests put a pin from where they're from. It was incredibly to see the diversity of people that came from near and far to visit Sydney. Though there were already a few pins from NY, it felt awesome to leave my mark there. It's important to get AirBNBs that will make you feel at home. If you're a girl, either solo traveling, or with another girl, I highly recommend booking this apartment (for only $80 a night!) Plus, the neighborhood is specifically called Wooloomooloo, basically the coolest name I've ever heard. FOOD Beware...Sydney is very expensive, but definitely worth it! Enjoy a drink along the water at the Sydney Opera House with views of the Harbour Bridge. It's stunning at night. I actually ate most of my meals at small local places (I don't even remember the names!) and my big meal out was at the Rockpool Bar & Grill. If I could do it again, I wouldn't bother going to such a nice restaurant on my own. Sometimes it's better to just grab a low-key bite to eat and spend your evenings exploring the city. My favorite cafe that I went to was at Bondi Beach, called Speedo's Cafe. They serve the most beautiful pink pittaya bowl that was almost too beautiful to eat. There are tons of restaurants along the water at the Harbour. The better the views, the higher the prices, but I thought it was totally worth it. I wanted to soak up that Harbour view as much as I could! SIGHTS There are so many fun excursions in Sydney and I didn't even do half of them! My favorite was walking across the Sydney Harbour Bridge. I'm horribly afraid of heights and only got over them because I fly so frequently, but I knew that I only had one opportunity in the near future to walk across the bridge so I knew I had to do it! Apart from the GBR snorkeling excursion, doing the BridgeClimb was my favorite. It's incredibly safe and well-designed. You're prepped, given proper clothing, and even get photo ops while you're up there! Visit the website to see all the celebs who have done it as well as a detailed description of the experience. When I finished with the walk, I couldn't stop smiling because I had face my fear and walked over one of the iconic views in Sydney. Definitely don't miss a trip to Bondi Beach. It's definitely overrated, but you can't go all that way without visiting the iconic beach. Note: even if it's cloudy, you must wear sunscreen. The Aussie sun is SO strong and I left the beach way too sunburnt. Visit the gift shop for some Bondi Beach lifeguard gear (makes for great gifts) and take tons of pictures. The murals along the beach are incredible and made for some of the best photos. Don't forget to grab a pittaya bowl at Speedo's! Lastly, you must visit the Taronga Zoo to see kangaroos and koala bears! The zoo is a quick ferry ride (you can see the zoo from the Opera House) and was a fun escape from the busy city for a few hours. It's a incredibly well-designed zoo with a variety of animals--definitely worth the ticket price! Pay a little extra for a photo op with koala bears. Unfortunately due to laws you can't hold them, but you can get close! They remind me of little old men! So cute. I couldn't stress this enough: If you have a dream to go somewhere, you have to work as hard as possible to make it happen. Don't wait for someone else to agree to go on a trip because it's likely they'll make up some excuse as to why they can't travel that far or spend that kind of money. If you plan accordingly by doing extensive research and opting for an AirBNB instead of a hotel, it's more than possible to travel. I work multiple jobs while balancing a college schedule to make dreams like this happen. If you're interested in more details on this solo trip or want advice on how to book inexpensive excursions and AirBNB, please reach out. I'd love to help. Don't miss my photo album with more pictures from this incredible trip! Cheers, mates!